No LORAC swatches again, the terrible weather holds. On the bright side it's supposed to clear up by this weekend, and you know what I get on Monday? More LORAC. No joke. I have five more eyeshadows and another cheek stamp coming- you know the routine- stay tuned. Here's something to tide you over the weekend. I went to Target today and found that they reset the Boots, Sonia Kashuk, pixi, NP Set and Jemma Kidd displays. This is a good thing, because they've been around for so long that they were getting appallingly disgusting- smeared lipstick, greasy fingerprints and broken eyeshadow cakes galore. I was pleasantly pleased at the new items, I'll be honest that I wasn't expecting much. I'll be talking about my experience and what I saw in three installments. Sonia Kashuk- the new display is finally up! Here's the good news- I did actually see that palette, the two brush sets, the big kabuki brush, the powder brush and the foundation brush there. The bad news? The brushes in the sets don't meet my expectations. The smaller Out-of-the-Woods 4pc set where very tiny. I estimated that they were about five inches long, no joke. The flat top brush, which I was highly anticipating, had a very tiny head. The rest of the brushes just had such small handles that I didn't really even want them. This might be great for a travel set but since that wasn't what I was looking for, I decided to skip it. The other set, Out-of-the-Woods 6pc was also much smaller than I had hoped for. The blush brush (largest brush) was the only brush that I really wanted, it looked like it would fit the apples of the my cheeks well. However, the second largest brush (when I looked at the back of the package, it was described as a 'multipurpose' brush) puzzled me. Multipurpose for what? Much too small to be a powder brush. It has a tapered end (more tapered in real life than in photo) so I didn't think it'd be that great at blending highlighter or anything else that you want to diffuse gently. It's too large for anything relating to the eye, what the heck would I use it for? 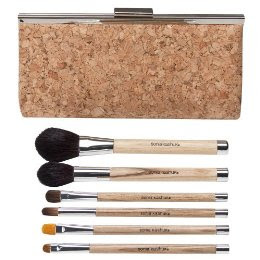 The other brushes, a crease brush, smudging brush, concealer brush and small eyeshadow brush looked nice, but since I already have about 5 of each kind, I couldn't justify $19.99 for a set in which I only appreciated one brush. I would rather buy one good Sigma or MAC brush. The good news? 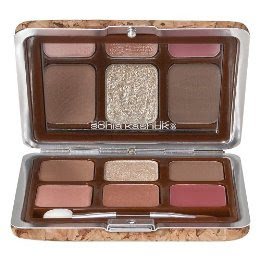 The Spring Awakings palette ($16.99, top of page) looked quite nice. I wasn't able to swatch it or purchase it (yet! ), but I can say that I would use all the colors, because they were very well coordinated. The kabuki ($12.99) was very nice and full, I wanted it and have mentally added it to the list of brushes I -need- to get. 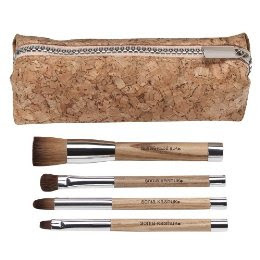 Same with the foundation and big powder brushes, and the bamboo handles are gorgeous and the perfect length, they'd really make a statement among my other brushes. I went in intending to buy the 3 eyeshadow brush set, but alas they were out of stock already. Now, I understand that it's limited edition, but it really shouldn't be limited quantity in stores. That's just ridiculous. In fact, there was only one or two in stock of everything that I saw there. And the display was brand spankin' new, I've been stalking Target just waiting for this collection to come out. One last thing- blue peeps were stripped from the display! That's right, I couldn't find the blending sponge anywhere, I have a sneaky feeling I'll see it marked down on a clearance end cap soon. All in all, it was much easier to talk myself into walking out of Target with only a Vitamin Water ( tranquilo- tamarind/pineapple flavor, it was superb and oddly complex for a flavored water drink) than I had originally anticipated.